Yesterday we blessed Cash. It was quite the group of family we had. I sure love being close to family! THIS GIRL LOVES her new little brother! She is such a great helper! Always the first to come to his rescue when he's crying. Jon has been deemed "Baby whisperer". He is so good with little Cash! He's also very good with the other two crazies! We love him so much! He's headed to BYU-I at the end of this week and we are going to miss him tons! Look who's here! Cash was born on December 9th. We love this little baby boy SO much! I've posted all the details on his own blog. 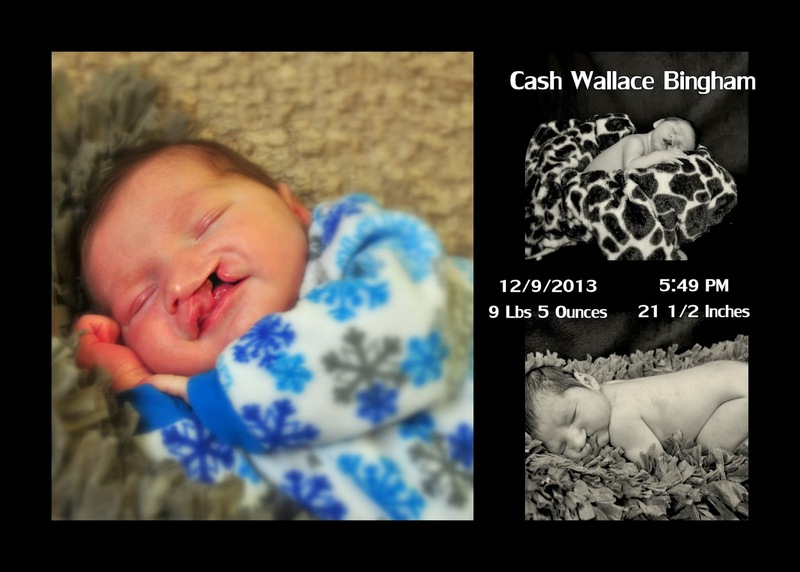 Go to cashwallacebingham.blogspot.com to read the whole story, and to keep up with all the adventures of Baby Cash! These two munchkins love their little brother! The best Christmas gift I got this year! Christmas day was the first "real" day we did nothing but stay home and veg. It was wonderful! I held Cash all day- watched my kids play all day- let the mess go all day- sat around in my jammies all day- and just enjoyed it. It was truly a Christmas to remember! Here is our "Mom Tree" Christmas Tree. I love getting a real tree. This year we didn't make it to the mountains (due any day with a baby... not this year). But we did go to Moody's here in town. Here's a little view of our Christmas decor. I think it feels magical with only the Christmas lights on. Christmas morning after Santa came! The Jensen grandparents, the Bingham grandparents and Spencer all came by to bring us presents, see what the kids got for Christmas, and say hello. (It was nice of them to come to us! We loved seeing them on Christmas day! Grandma Jensen getting some Cash loves! This year we went to the parade of lights in Twin Falls. The kids LOVE any type of Christmas lights, and this was just as cool as ever! We all bundled up warm (even though the kids' toes got cold) and enjoyed the freezing cold weather and light parade. We didn't know they would be handing out candy, so by the end of the parade our pockets were stuffed! We also didn't know they would be handing out HDMI cables... especially to 2 1/2 year olds ;) Brogan was just as surprised to get this as we were to see it in his hand haha! I loved this train! SO cool! Both kids are faithful parade "wavers". I love it! After it was over we warmed up the car, got into some nice warm jammies and got some nice warm hot chocolate.